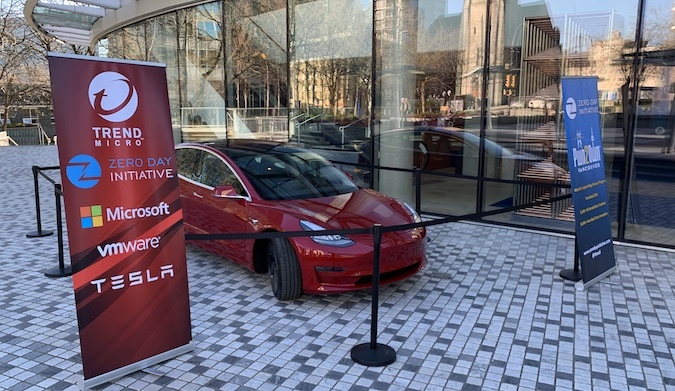 A team of researchers has earned $35,000 and a Tesla Model 3 after hacking the vehicle’s web browser at the Pwn2Own 2019 competition that took place this week in Vancouver, Canada. The third day of the event was dedicated to automotive hacking. Two teams signed up initially, but one of them withdrew just hours before the start of the third day. Amat Cama and Richard Zhu of team Fluoroacetate, who were the only ones to take a crack at hacking a Tesla, managed to display a message on the car’s web browser by exploiting a just-in-time (JIT) bug in the renderer component. The duo earned $35,000 for their exploit, along with the Tesla they hacked. This was the first time Pwn2Own had an automotive hacking category. Team Fluoroacetate targeted the Tesla’s infotainment system, but the rewards were much higher for components such as the modem or tuner, Wi-Fi or Bluetooth, key fobs (including the phone used as a key), and the autopilot. The highest reward, up to $250,000, was offered for hacking the gateway, autopilot or security system. Cama and Zhu won a total of $375,000 in cash at Pwn2Own 2019 for demonstrating exploit chains against Safari, Oracle VirtualBox, VMware Workstation, Firefox, and Microsoft Edge. Other participants hacked Firefox, Edge, Safari and Oracle VirtualBox. In total, organizers of the contest paid out $545,000 for 19 bugs. All the vulnerabilities exploited at Pwn2Own have been reported to vendors, which have been given 90 days to release patches. Trend Micro’s Zero Day Initiative (ZDI), the main organizer of the event, will disclose the details of the most interesting vulnerabilities once they have been resolved.